“‘For my thoughts are not your thoughts, neither are your ways my ways,’ declares the Lord. ‘As the heavens are higher than the earth, so are my ways higher than your ways and my thoughts than your thoughts,’” (Isaiah 55:8-9). Had we made a huge mistake? We’d prayed about this job opportunity. We’d sought wise counsel from a trusted friend. Then we prayed some more. After two trips to the hospital with our newborn and six weeks of sleepless nights, it looked like this open door for a different job was an answer to prayer. Not only would it bring us close to our home church again, we’d also have friends and relatives around to help out. We could finally breathe a little easier. But after loading up the family and hauling everything we owned 700 miles to our new home, we never expected to face this. The start-up company that offered my husband the job closed its doors. This turn of events hit hard, leaving us with the uncertainty of unemployment while providing for a new baby. It caused me to question: how could we have been so sure this was God’s will? If He really brought us here, why would this happen? I wondered whether or not I even knew how to follow God’s plan. But through our experience, I discovered life-changing truths in God’s Word to help me understand His plan for my life, and how to follow it with confidence. When you ask the Holy Spirit to guide you, trust He will. Sometimes we will not hear God’s audible voice offering the direction we seek. In the quiet waiting, it’s easy to let our minds wander into a whirlwind of questions and concerns. When this happens, we need to remember the moment we invited Jesus Christ into our lives. Because of His deep love for us, He sent the Holy Spirit to be our Comforter and Guide. John 16:30 says,“The Spirit will guide you into all truth.” So even if I don’t have a definite answer, I can trust that the Spirit in me provides what I need to make any decision with clarity and a steadfast heart. Instead of making it complicated, focus on the simplicity of God’s will. God’s Word offers simple steps to follow for those who seek His will. “Rejoice always, pray continually, give thanks in all circumstances; for this is God’s will for you in Christ Jesus,” (1 Thessalonians 5:16-18). Rejoice. Pray. Give thanks. These three actions will cast aside all the distraction of our runaway thoughts. When we bring our focus back to the simplicity of God’s will for us, we suddenly lose the urgency of having to decide right now. Our focus becomes how we live our lives for God, not how He answers our prayers. Know God’s plan may go against what makes sense to us. Instead of giving time and energy to the what-ifs, we can remind ourselves that an unsure outcome opens the door for God to be glorified in our situation. And isn’t that what we desire most? God amazes me again and again with His faithfulness through circumstances that seem impossible. During our 10 months with no income, we never missed a meal. Our family had a place to live, our needs were met, and loved ones who surrounded and supported us. God works in ways so that we cannot find comfort in our own works. We don’t need to worry about how it will all work out; we only need to trust God through it all. Understand even the bad stuff may be part of the plan. The familiar words in Jeremiah 29:11 bring us a sense of anticipation. When we hear that phrase,“I know the plans I have for you,” we smile with hope for the adventure ahead. But what about when the next step isn’t so exciting? What about those times when anticipation is replaced with dread for what’s to come? We may not feel excited through life’s darkest times, and that’s okay. God doesn’t expect us to fake a smile when we’re facing trials and turmoil, but He does offer us His presence for peace and comfort. He also promises this.“And we know that in all things God works for the good of those who love him, who have been called according to his purpose,” (Romans 8:28). Remember that God’s plan has a greater purpose. My family’s next step resulted in an extended time of trusting God on a deeper level than before. Each day I had to redirect my thoughts back to God. I purposed to give thanks and find joy in everyday moments instead of dwelling on our situation. Keeping my mind stayed on God drew me into a closer relationship with Him. “You will keep in perfect peace all who trust in you, all whose thoughts are fixed on you!” (Isaiah 26:3 NLT). At the end of our unemployment journey, God provided a new job even better than the one before. It involved another move, but from our experience we learned to walk through that door with newfound assurance. We may never know if we made the right decision for our family that fateful day, but we continue to see God’s promises fulfilled. Ephesians 1:11 reminds us God’s plan has a greater purpose than what we see.“... for he chose us in advance, and he makes everything work out according to his plan.” When we show God our willingness to trust Him in every situation, we become a part of that greater purpose. 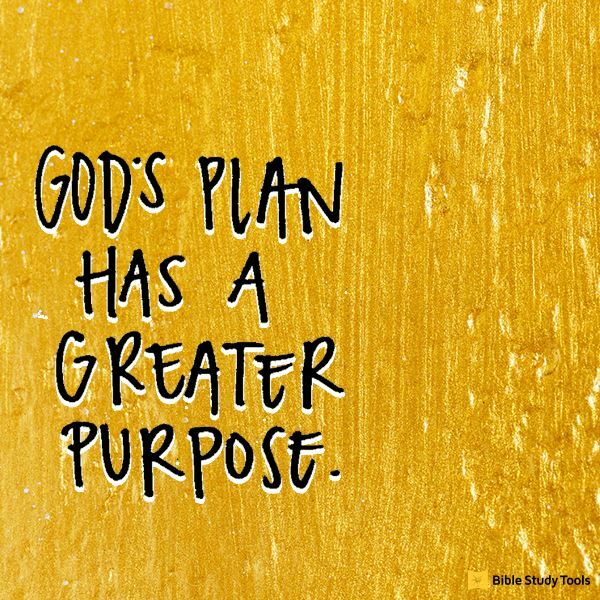 Editor’s Note: Part of this devotional was taken from How to Follow God’s Plan by Dena Johnson Martin. You can read the full blog post here.